Skin So Flawless You Won’t Need a Filter. You Won’t Need a Filter. Are your bathroom drawers stacked with expensive skincare products that you don’t even use? How would you feel about taking better care of your skin, but spending less time while doing so? We totally get it. Life gets crazy when you’re twenty something. From the moment you wake up, your day goes non-stop: school to work, friends and a social life, and a bit of good food and exercise in-between activities, before the day is finally done. With things getting crazy on the daily, who has the luxury of time (or the money) for a ten-step skincare routine every morning, noon and night? You don’t want to pay through your nose for something expensive that will only last for two months. So wouldn’t it be nice to have the very same skincare benefits – but only in an uncomplicated, easy-to-use skincare product that will last up to half a year? Silver Soap 30g Travel Size $40.00 Now: $32! Cor Silver's essential philosophy is to combine natural ingredients with a patented scientific delivery system. This combination brings essential vitamins, moisture, and protein to your skin cells in the most effective way. The Science of Cor Silver explains the delivery system and specific ingredients that make Cor Silver products. *Order NOW and use code FREESHIP for a one-time free shipping cost. "I had several dark spots on my face, using this soap I was able to eliminate it almost completely. The skin colour improved and it is glowing. Very happy and will recommend it to anyone who wants to get rid of dark spots." "I’m almost 30 and had deep acne through adolescence that I cleared up in college with Acutane, but still have some leftover mild discolorations and pitting along with the first signs of aging. Using this in conjunction with a mild nightly skin lightener has given me the face of my 12-year-old self (if I hadn’t had acne at the time). I’ve had my big bar for three months and have barely gotten through what I think is ¼ of the bar." "I’ve tried it out the last three days and it’s amazing! My skin has cleared up within two days! I can’t wait to see what else it does as I keep using it! The facial soap rocks! I LOVE the soap! It’s amazing how it lathers up quickly and really does get your makeup off! I love it!" "Even using it just once a day, my skin looks fabulous. No blemishes, tighter pores, and I swear I look younger. All this from a soap! What more could you ask for?" "I think even the travel size would last for absolutely ages, making what seems like an expensive ‘soap’ actually quite an economical cleanser and face mask all in one." "This is likely the best facial cleansing bar I’ve ever tried. I highly recommend this to anyone suffering from acne, especially if your complexion is really oily or just really imbalanced, going from dry to oily." "The magic happens as you work this cleanser over your skin. It will remove makeup, eliminating the need for a separate facial makeup remover, saving time and money. For me, it has evened out my skin tone by near ridding my cheeks of rosacea and after 3 weeks I am starting to see a reduction in the appearance of my sun damage." "I also tried to use it to remove foundation and it worked very well. Now after more than a month of usage, my skin has never been so clean and glowy and the pores are significantly reduced too." Cor Silver Soap® is the convenient one-step solution that cleanses, tones, and exfoliates your skin – but also removes makeup with ease. Wake up with a natural glow, with no more panda eyes on your pillows every morning! Finally: a natural skincare product that’s as effective as it is fuss-free! Just Foam, Rinse, and Glow® with all the incredible benefits that Cor Silver Soap® can provide – in just five minutes! Beyond its natural cleansing qualities, Cor Silver Soap® also fights signs of aging, and helps protect your skin against the sun’s harsh effects. That means you’ll keep your youthful glow for longer – win! Good skincare should help to keep your skin’s natural moisture. And that’s why Cor Silver Soap® uses rich, nourishing vitamins from Jojoba, Avocado, and Aloe, with a unique Japanese CSC (Collagen, Sericin & Chitosan) compound to draw healthy ingredients deeper into skin cells for maximum benefit. It’s the simplest beauty regimen that gets incredible results: Just five minutes, twice a day. Cor Silver Soap®, although simple to use, works differently from a normal bar of soap. In fact, don't think about it as soap – see it instead as a creamy foaming cleanser that’s activated with water. This is also why a bar of Cor Silver Soap® lasts so long: because just a small amount of water on the soap creates a creamy foam. There’s no need to rub the bar directly onto your face! With some water splashed onto both your hands and face, rub the soap between your hands for about 15 seconds until you have enough foam to apply onto your skin. Gently apply the foam to your face, and leave on for about two minutes. That’s how simple it is to use! Leave it on while brushing your teeth, or while washing up in the shower – you’ll start to see results after about a week of use. Best Normal Skin Cleanser, Self magazine, Editors' Choice Award, Beauty Shortlist Awards. "Never have I brought in a product that is being discussed so much by everyone – from the call center staff to the President of the company. " "Just a quick note to say I really enjoyed meeting you in NY and am fascinated by the Cor Silver soap. It works! Have been using it on my face and back and my skin feels super clear and very clean. My back in particular was the test and the results have been really impressive." "I've been meaning to send you this email for months now. I wanted to thank you for giving me two small samples of Cor Silver during LA fashion week at the HD Buttercup suites in March. I passed them along to my younger sister who has struggled with acne for a decade. You know the story, thousands of dollars invested in hundreds of treatments and products to no avail. Well, Cor Silver has transformed her skin. It glows. It's clear. It's beautiful. Thank you. It's like some kind of miracle. So, please keep making it because she's hooked for life! Now my older sister, who has beautiful skin mind you, is hooked on it too because she says it's made her skin even more so. As if that were possible, but apparently it is thanks to Cor Silver. You've created something quite spectacular here and I'm anxious to share the news with our readers and anyone else who will listen. Please let me know and thank you again for creating a wonderful product and for sharing it with me. Looking forward to hearing from you." 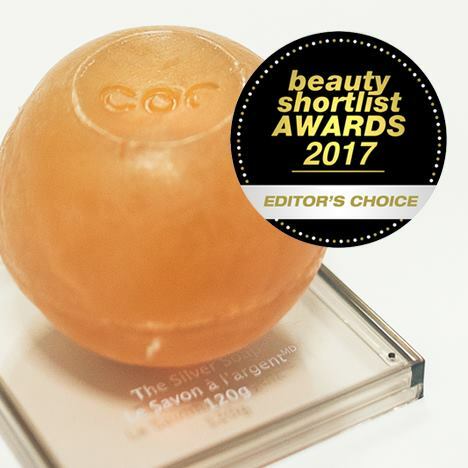 "I want to tell you that the Cor Silver soap is really a miracle to my skin. You have to come and visit us again to see how it works on me." "I LOVE your soap. I specifically use it at the gym and it is perfect. I wash with it AND shave with it. I am a shave cream connoisseur, and it is PHENOMENAL to use for shaving. I have a coarse, tough beard, and it works like butter! Really amazing. I also love the lotions. Been using them to prep clients’ faces before I do makeup." It’s not just the professionals. So don’t miss out on your own chance to keep your skin looking incredible, in just five minutes – twice a day. five minutes – twice a day. Get your own bar of Cor Silver Soap® for a limited time only, with a 30-day money-back guarantee! If you don’t see incredible improvements to your skin after 30 days, return your product to us for a full refund – and no questions asked. Act now! Only 1,000 products available for this very special offer, so claim yours today. And begin your brand-new, no-fuss, skincare routine with Cor Silver today! © 2018 Cor Silver Skincare. All Rights Reserved. © 2018 Cor Silver Skincare.